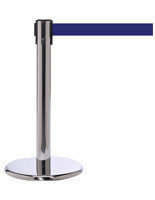 Featuring a polished stainless steel pole, this short gallery barrier will prove to be a worthwhile investment for your business. 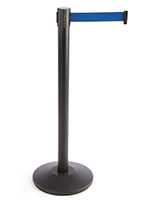 Featuring 4 available belt slots allows for a number of configurations to perfectly conform to your buildings layout. 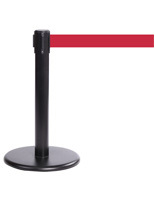 Use this modern barrier to restrict access in exhibits, art museums, auto shows, and more. 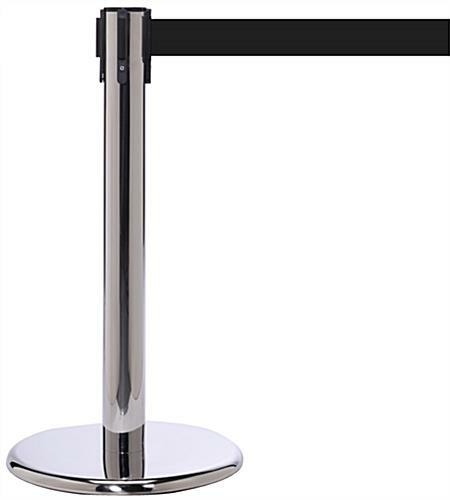 The sleek pole effectively blocks off areas from unwanted tampering while adding style to the existing décor. 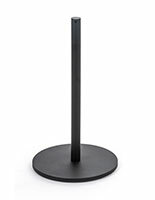 Each post stands 24” high and sets up quickly by screwing into the flat profile base. Place these barriers around your exhibit or art museum to start protecting high valued displays in style. I picked up four of these to use as a barrier at motorcycle shows. 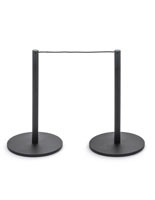 The description for these is spot on; they are extremely sturdy with a very heavy base plate. They come with the posts separate from the base. Simply threading the post onto the base is all you have to do to set them up. The belts extend to the advertised length. The only problem I had was that two of the posts were a little wobbly after screwing them onto the base. After taking them apart again and looking at the insert that slides into the bottom of the post, a little reverse engineering quickly revealed that tightening the two screws in the bottom of the insert solved the problem. Now all four of them are rock solid. Nice product.